SWOT Analysis is a simple tool or framework for identifying and analysing strengths, weaknesses, opportunities and threats facing a business, project or programme. It is also very useful for assessing yourself and for planning your personal development. Carrying out a SWOT analysis can be useful preparation prior to a job interview, in order, to be clear in communicating your strengths. It is also useful to sketch one out on a regular basis for personal development and career planning. The knowledge of the strengths and weaknesses can paint a broad picture of your current status. 1. As a tool for getting people together to kick-off a planning or strategy crafting process for a project, programme or business. 2. It can be used as a sophisticated management tool for decision making and for your own personal development / career planning. Done properly, a SWOT analysis will give you a clear picture of the most important factors that can influence or inform the survival and sustainability of your project, programme or business. As well as a plan to act on. When carried out on yourself, it provides a clear picture of where you need to focus in your personal development and career planning. 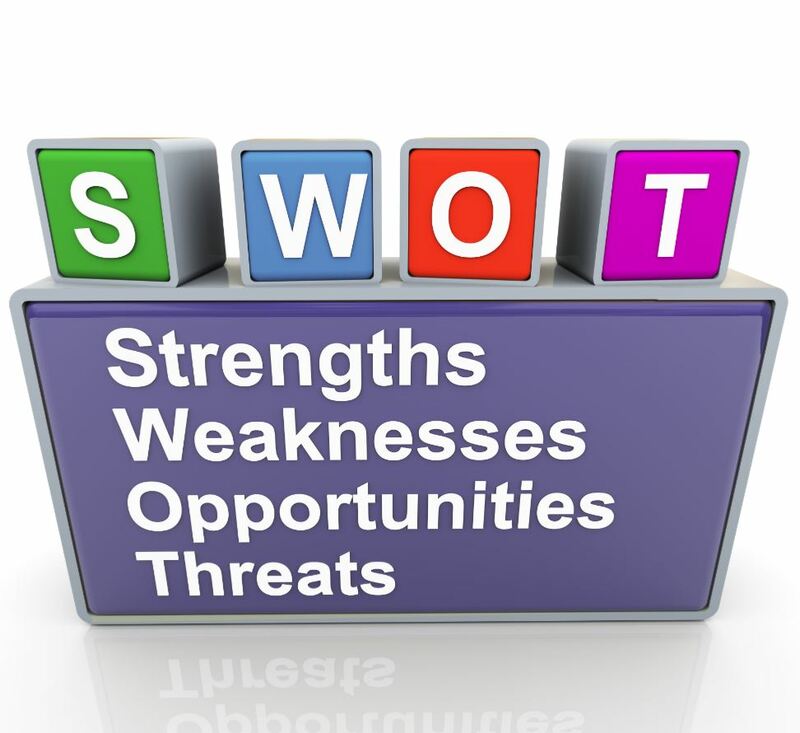 SWOT Analysis is popular because of its ease of use and flexibility. With little effort in thinking it can help to highlight where an individual, project, programme or business idea is strong and vulnerable and where there are opportunities to explore and competencies to protect. The result of this process is the crafting of a ‘plan of action or strategy. Available and accessible to decision makers in exploiting opportunities in their external environment or to counter threats from the external environment. What does the individual, project, programme or business do better than any other else? What advantages does this person, project, programme or business have? What resources can this person, project, programme or business draw upon that others can’t? How can it best exploit its strength in relation to the opportunities available to it? Which strengths should the organisation seek to develop for the future? Weaknesses are a lack of competences and skills required to perform better than the competition – e.g. in the design, development and implementation of project, programme or business ideas? Lack of key attributes – e.g. no brand awareness or reputation, lack of skills. What essential competencies or resources need updating and strengthening? What will key stakeholder see as weakness of the project, programme or business? Decide whether remedying weaknesses is more urgent than building on strengths to exploit opportunities. Does ignoring key weaknesses make the business or project vulnerable to threats which could lead to the demise of the project or business? How can critical weaknesses be converted to strengths? It is important to bear in mind how long opportunities are and how you or the project, programme or business can take the best advantages of these opportunities. Threats are things that have the potential to damage or hinder performance. Threats mostly arise from competition and or from factors or forces out of the control of the decision makers of the project, programme or business. Is changing technology threatening your project, programme or business position? Is there debt or cash-flow problems? Could any of your weaknesses seriously threaten your business / career? Do threats need managing more urgently than the opportunities pursued? What threats need to be dealt with immediately and in the short term? How can critical threats be turned into new opportunities? It is important that the four components of the SWOT analysis are considered together and not in isolation. This is because a factor can be both a threat and opportunity depending on the situation. For example new or changing technology could be highlighted as both a threat and an opportunity. Do not overestimate the strengths or under estimate weaknesses of your business or project. Be very realistic in your analysis. Your analysis should distinguish between where your business or project is presently and where it could be in the future. Keep your SWOT analysis short and simple. Avoid unnecessary complexities.